The smartphone features a TI OMAP CPU with two 1.2GHz cores. There is a gig of RAM on board and 32GB of built-in memory (28GB is available to the user). The display is a gorgeous 4.65″ Super AMOLED unit with HD resolution (720×1280 pixels) and a pixel density of 316ppi. It has oleophobic coating. There is a 5MP camera on the back of the device, capable of recording 1080p videos and a 1.3MP front-facing unit for video calls. A full connectivity suite is at your disposal, including NFC. 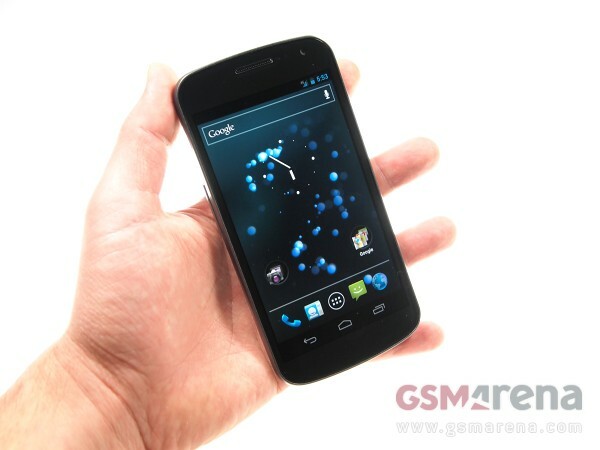 The Samsung Galaxy Nexus measures are 135.5 x 67.9 x 9.5 mm, and its weight tips the scale at 150 grams. A 1850mAh battery powers the smartphone. In terms of design, the device is unmistakably a member of the Nexus family. Like its predecessor, the smartphone features a curved display for better ergonomics. It is one of the most understated phone designs we’ve encountered – there is a total of two hardware buttons on the entire device. Check out its live shots below. The software of the Samsung Galaxy Nexus is certainly its biggest highlight (after all, we’ve seen quite a few impressive spec sheets this far into 2011). The smartphone is the first device featuring Google’s latest Android 4.0 Ice Cream Sandwich OS. Our unit came with the 4.02 update already installed. See it in action below. We have more features of the LTE packing Samsung Galaxy Nexus in the pipeline, so stick around.